Back to School Deal Alert! I’ve been going to JCPenney (now better known as the more hip… jcp) since I was 18. I was the receptionist at the store in the Paradise Valley Mall while I went to beauty school. That’s right! I was a beauty school drop out! Well… not really. I completed the nail technology program and was promoted from receptionist to nail technician in the salon. I still go there. In fact… if you’re in the Phoenix area… you should be seeing Brian Sullivan for all of your hair needs. He’s been with me through blonde, brunette, and red… long, short, and in between. He’s even given me amazing hair extensions. But… I digress… we’re here to talk about an amazing Back to School Deal! 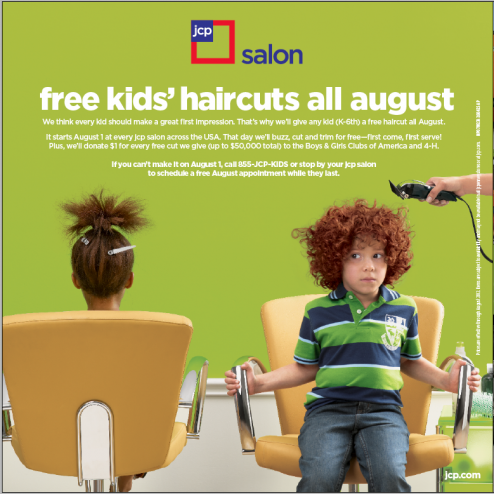 During the month of August… all 949 jcp locations will be giving FREE haircuts to kids! For reals. Just take your little ones in during the month of August and you’ll score a free back-to-school hair cut (K-6th)! In addition… jcp will be donating $1 for every head of hair cut on August 1st. These donations go to support The Boys and Girls Clubs of America and 4H. Don’t need a hair cut? There’s an eye wear special at jcp too! You can get a complete pair of eyeglasses for $25 for kids ages 16 and under. The focus of this campaign is for jcp to be a part of helping families and kids look and feel their best for the new school year. So be a part of the initiative and visit your local jcp salon for a kids haircut on August 1st to benefit The Boys and Girls Clubs of America and 4H. The BGCA officially began in 1906 and annually serves more than 4 million young people each year through membership and community outreach! *Disclosure: I was given a nifty gift card to jcp for sharing this awesome deal with you. I’d share it anyway… who doesn’t love a good deal? Join us for SMA Day 2012 at Chase Field with the Arizona Diamondbacks! Who: You. Your family. Every Dbacks fan you know. Every local San Francisco Giants fan you know. Fans of Chinese food, Mexican food, sushi, pizza, burgers, popcorn, hotdogs, margaritas, Leinenkugel and TCBY (all that and more are available at the fabulous Chase Field). What: A leisurely Sunday afternoon Dbacks game. When: Sunday, September 16, 2012. First pitch will be thrown at 1:10pm. Where: Chase Field, downtown Phoenix. How: Simply visit the Families of SMA event page. Select your seats from the available baseline and bullpen reserve seats (sections 106-111 and 133-138). Follow the instructions to complete your purchase online, or see the contact information on that link in order to purchase handicap accessible seats. Why: A portion of the proceeds from tickets sold via this link will be donated by the Arizona Diamondbacks to the Families of Spinal Muscular Atrophy charity. SMA is a terminal, debilitating muscle disease affecting infants and young children (primarily), and is the reason why this blog’s resident five year-old twins, Kyle & Lauren, cannot sit, stand, walk, or eat on their own. SMA affects 1 in 6,000 births, and is equally prevalent across all countries, races, and ethnicities. Families of SMA is a critical support system for families affected by SMA and over the last ~30 years has funded nearly $30 million dollars of research to find a treatment and cure for SMA. 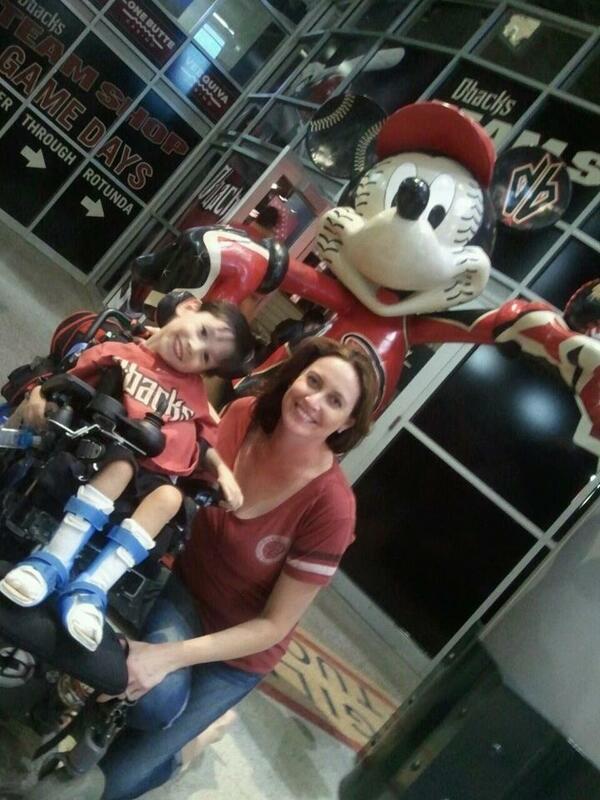 My Kyle adores the Dbacks. At age four he went from having no knowledge of the game to being an expert simply from playing the Wii Sports game on the family’s Wii. Now he enjoys many Dbacks games in person at Chase Field and the rest he watches on TV from home. He is as obsessed with his favorite team as a kid could possibly be. Watching the Dbacks gives him so much joy and even if they lose–he gives nary a care. His is an unconditional love. This is why our family is so touched that the Arizona Diamondbacks organization reached out to our Phoenix chapter of FSMA and is donating to our good cause. Even if you’re a Giants fan, we welcome you to join us on September 16th–but bring a tissue for your loss tears while you watch our 2011 NL West champs give your Giants the what-for in a state-of-the-art, climate controlled, one-beer-only-costs-nine-dollars facility! Phoenix Children’s Hospital, 12/2011. 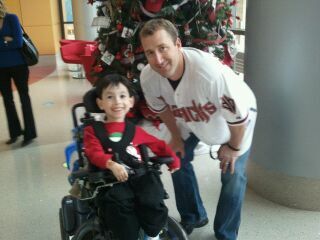 There Willie Bloomquist stood, innocently posing for fan photos yet unfortunately blocking Kyle’s view of the Dbacks Christmas Tree in the hospital lobby. Kyle humored us to pose for a photo before he rushed to turn around and admire the tree (it really was a cool tree, later auctioned off for charity). Mr. Bloomquist was so sweet to him and charming to me, and that day is why the only Dbacks jersey I own is #18 (well, I do own a Randy Johnson jersey, but only because my last name was Johnson and it was narcissistically pleasing to wear my own name. Also because Randy Johnson was kind of good, too). We must sell 200 tickets via dbacks.com/sma in order to get the maximum donation the Dbacks organization can offer–so buy your tickets now and spread the word! 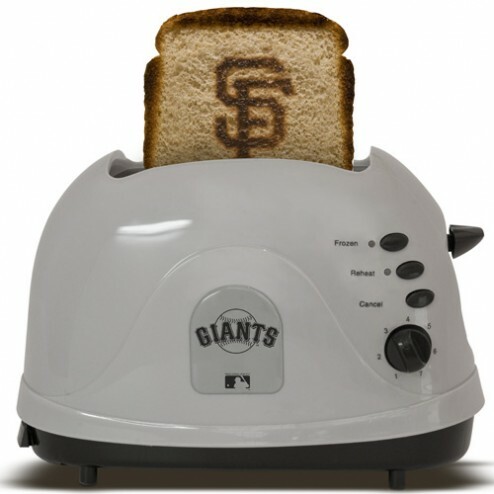 Q: What will the San Francisco Giants be come sundown September 16th, 2012? Where on Earth is my header? I don’t know… I have a call in to my designer. Hopefully he can fix it.